What promotional ideas are trending for B2B marketing in the latter half of 2018? Let’s have a look. Promotional product ideas are changing fast in 2018 and in the latter half of 2018 there are a few new marketing trends that are climbing the charts. There seems to be a clear and newly emerging marketing trend in the field of promotional swag in the latter half of 2018: almost all of the new promotional ideas seem to somehow involve your smart phone. POP socket: The first is the pop socket. This ubiquitous round disc is the perfect place to launch your logo or brand from. Inexpensive and easily seen by hundreds of people each day. The round pop socket is the leading promotional idea. POP socket square shape: Not every logo is round or even looks good on a round substrate so now there’s a fix for the that: the square pop socket. 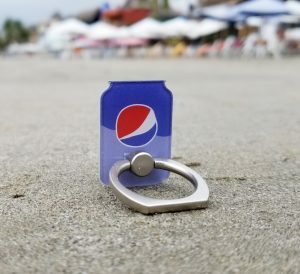 Custom shaped POP ring: If your business has an iconic shape why not go full hawg and get your shape made into a custom shaped pop ring? Why is business marketing so important these days? Old school media such as newspapers, yellow pages and radio are on the way out. Advocates for these mediums will argue against that fact but the short answer is that these older types of ad mediums are just no longer producing results they once did. Very simple…the power to advertise your own business is not just in your hands but is BEST to be in your hands. This is one of the reasons that Trade Show 8 and its line of unique and eye-catching promotional products are so important. Firstly, they are factory direct, which allows the biggest bang for your buck. Secondly, at the same time we concentrate solely on trendsetting swag such as keysmarts, pop sockets and other retail friendly swag. We are consistenly seeking out the latest promotional ideas for every industry and bringing you the 8 coolest and most effective marketing trends. Maximize your budget and ramp up your logo marketing impact! Trade Show 8, the trade show and B2B swag experts. Call Toll-Free at 1-888-908-6932 or email People@Tradeshow8.com.